For Procol Harum, A Whiter Shade of Pale was unfortunately a chart success that became a nagging mythos. 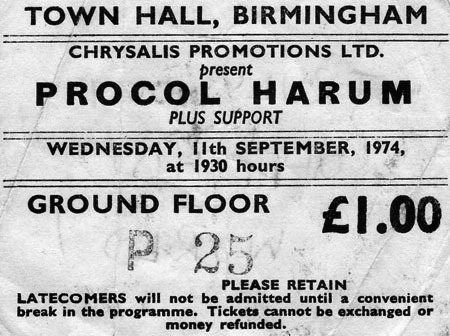 When they kicked off their present tour at Birmingham Town Hall last Thursday, thankfully there were none of the usual raucous demands for the song's resurrection. Nevertheless Procol decided to encore with it (along with Lennon and McCartney's Eight Days a Week), but gone are its ball and chain associations, and the band performed Pale in the spirit of a fondly remembered Golden Oldie. They began with Bringing Home All the Bacon and you knew you were in for a treat. Following on, Gary Brooker introduced Grand Hotel as a remembrance of better days. Material from their recent album was greeted enthusiastically and highpoints were As Strong as Samson, Nothing But The Truth and The Idol, all tinged with that familiar polished melancholy. Next came a new number, The Poet, [later named Without a Doubt] which owes much to Paperback Writer: catchy tho', and there aren't many in the same vocal league as Brooker. It was then pointed out that there's no place on this sceptred isle further from the brine than Brum. But we still got the gulls care of Brooker FX. The doom laden chords of A Salty Dog with the dramatic narrative soaring over Chris Copping's atmospheric organ was rapturously received A lengthy Power Failure from Broken Barricades was a vehicle for Mick Grabham's searing guitar to put Trower's recorded contribution of old in the shade. BJ Wilson also let fly on drums and only ceased to express his amazement at the fact that such a large audience had turned out when Tommy Cooper was that very moment looning on the box! The support band, Strife, consisted of three lads from Liverpool who have been 'toiling for seven years'. They did a poor imitation of Cream circa '67, complete with frizzed hair, pounding bass, frenetic drumming and the obligatory 25 minute axe stretch-outs, which meant they bored with wah wah and then switched to an equally tiresome strobe bombardment. One member cavorted in the manner of a puppet Hendrix and then fortunately it was all over. Boys, you're still toiling. Ah, but Procul [sic] ... livin' legend and all that. It was Tommy Cooper who missed out. Catch 'em if you can.